The stock market also faces key elections in BJP-ruled Chhattisgarh, Madhya Pradesh, Rajasthan, and Mizoram in second half of this year which will set the direction for general election next year. 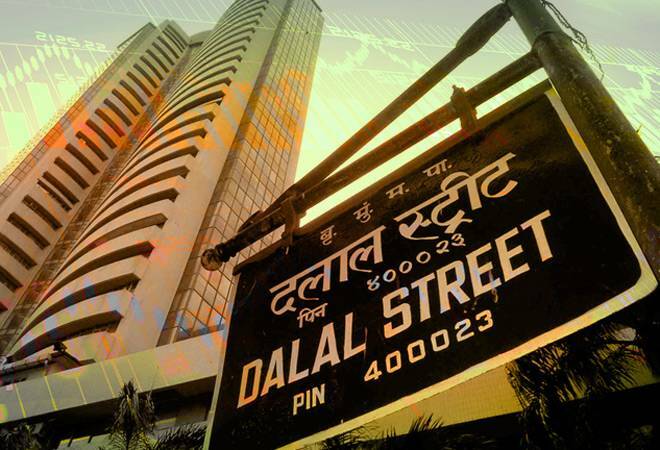 The Indian market seems nervous nearly an year ahead of going into General Election 2019 in absence of positive developments at home and negative global cues. The recently held Karnataka elections failed to push the market higher after the Bharatiya Janata Party (BJP) fell short of the majority despite becoming the single-largest party rooting out the previous Congress government. 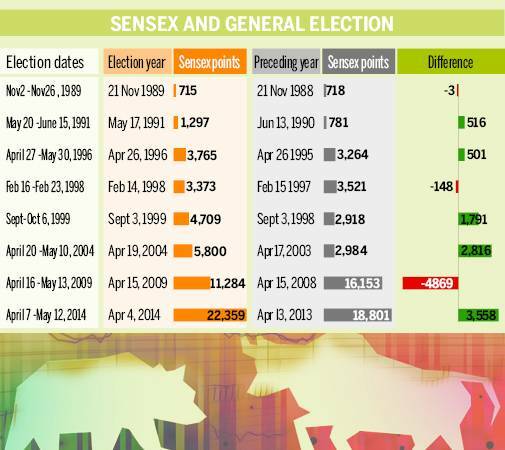 If past is anything to go by, Indian market has gained on five instances out of eight an year before General Elections were held since 1989. The market lost the most in a year before the General Election of 2009 falling 4,869 points due to the effect of global financial crisis on the economy. The Sensex slumped 27% in September 2008, the maximum during a single month till date. An interesting point to note is the market had been rising during the general elections in past in hope that a stable government will be formed in the era of coalition governments. Now, considering the current political situation, there are high chances that a coalition government will come into power in 2019. This would have a material impact on the movement of markets an year preceding the election date. Dr VK Vijayakumar, chief investment strategist at Geojit said, "A major factor influencing the market in 2018 would be politics. The state elections in 2018 will set the trend for the union election in 2019. Elections in Rajasthan, Madhya Pradesh and Chattisgarh by the year-end are important from the market perspective. These elections can give an indication of the likely outcome in 2019. The reason why politics is important is that markets like certainty and stability. Markets prefer a stable government under a strong leader to a weak coalition incapable of implementing economic reforms. Therefore, the markets would prefer the continuation of the NDA regime under Modi to a weak coalition composed of regional parties. The market is unlikely to breakout and move to a bull orbit in 2018. There are economic headwinds too like crude hitting $80 per barrel and its macroeconomic fall out. Fed tightening rates beyond market expectations is another worry. Corrections are more possible than up moves in 2018." Meanwhile, brokerages too are bullish on the prospects of the Indian market this year. CLSA has given a Nifty target of 12,000 in the first half of calendar year 2018. Morgan Stanley too is bullish on the Sensex and has given a target of 35,700 by December 2018. BNP Paribas has set a target of 37,500 for Sensex in 2018. Mr Jaikishan Parmar, Senior Equity and Research Analyst at Angel Broking said, "The big story will be the national elections in 2019. While PM Modi has pushed reforms and sustained his anti-corruption drive, the big challenge for the BJP will be from a united opposition. More so, considering that the BJP had a vote share of 31% in 2014. Markets will prefer a reform-oriented government but the worry will be unstable coalitions; and the market has enough experience of such coalitions in 1989 and again in 1996 and 1998. For now, the bigger resistance could be valuations. With the Nifty P/E at 26X, there is the worry over rich valuations. The best case scenario for markets in the next 1 year would be a flat to mildly positive market, at least till the general elections. A government committed to reforms in 2019 will be the launch-pad that the markets will be looking for". "Among other questions the political instability is the major factor that will effect how the markets perform, Modi Govt has faced a series of setbacks, the latest being the failure to form the Government in Karnataka. A listless opposition has suddenly tasted blood and a united opposition may be in a position to pose a stiff challenge to the Modi juggernaut. In the next few months if the opposition manages to stay united and the if the ruling dispensation witnesses a loss in some state elections slated to be held towards the end of the year, the markets would see a huge sell off and would remain week until the run-up to the elections," said Rahul Agarwal, Director, Wealth Discovery/EZ Wealth.